Chicago/The Blues/Today! was a series of three albums which were recorded in the winter of 1965. These three separate albums served as huge portal through which generations of blues musicians and fans have passed. These three long playing vinyl records became a defining moment in modern blues history. The album series was produced and annotated by the recently departed Samuel Charters. The original album photography was done by Sam’s wife Ann Charters. In 1999, Vanguard re-released the entire three volume series in a three CD box set complete with a forty seven page booklet. This re-issue was produced by Tom Vickers. Additional liner notes were written by Ed Ward. The box set has additional liner notes by Charters detailing his efforts and circumstances surrounding these recordings. Chicago/The Blues/Today! also brought the album concept, as well as concept album, to the forefront in blues music. The long playing record had emerged as the medium of choice in which white America purchased music. The album’s concept was right in the title. It was a straight ahead example of truth in advertising. The buyer certainly knew what they were getting ready to experience. You get the “where”, “what” and “when” right in the heading followed by the “who” where the performers on each platter were listed. All of this right above a stark, black and white photograph of the Windy City's elevated train tracks slicing through a thin blanket of snow. These words and that image serve as a metaphor for the groove that lies in the vinyl grooves of these Vanguard Records releases, a cold, tough, urban railway, elevated, but still slightly removed from the rest of the city and the world beyond. We can all take this route, if you are willing to separate yourself from the rampant commercialism which is an affront to the humanity which the blues meets head-on and embraces without apology. What these recordings document are musicians who, at the time, were lesser known entities on the Chicago scene. There isn’t a Muddy Waters, Howlin’ Wolf or Little Walter Jacobs for instance anywhere on these records. However, due in large part to these albums, these already accomplished musicians still in their prime, stepped into the larger spotlight they deserved. 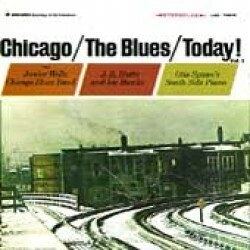 Volume 1 opens with The Junior Wells Chicago Blues Band which consists of Wells of course on vocals and harmonica with Buddy Guy on guitar, Jack Myers on bass and drummer Fred Below. They perform five tunes consecutively and pretty much draw up the blue print for the rest of the album and its subsequent follow-up releases. They are followed by J.B. Hutto and His Hawks. Then it is onto a wonderful showcase for pianist Otis Spann, who is accompanied by drummer S.P. Leary. These piano drum duets may be some of my favorites from this series. Spann who was only thirty five at the time of these recordings was already an accomplished master of the form. He died of cancer just five years later. Volume 2 opens with the Jimmy Cotton Blues Band. Vocalist and harmonica great Cotton is joined by James Madison on guitar as well as the dynamic duo of Spann and Leary. These along with two Verve releases in 1967 (The James Cotton Blues Band) and 1968 (Cotton In Your Ear) and another release in 1968 by Vanguard (Cut You Loose) represent the best recordings in Cotton’s long solo career. The five Cotton sides are followed by five tunes from the Otis Rush Blues Band. The recordings here are some of the best material by Rush since his late 50’s Cobra sides. He is joined by rhythm guitar player Luther Tucker, Roger Jones on bass and drummer Willie Lion. The alto sax playing of Robert “Sax” Crowder adds a wonderful dimension to these proceedings. Through the years much has been written about the influence and virtuosity of Rush’s guitar playing. Here he demonstrates not only that he is one of the most under rated blues singers in history, but also a marvelous ensemble player as well. Disc 2 closes with five tunes from Homesick James and his Dusters. The slide guitarist and vocalist is joined by Willie Dixon on bass and Frank Kirkland on drums. The inclusion of these five songs, like the rest of the series, shows a wonderful sense of dynamics, balance and textures which Charters brought to the studio as each ensemble represented different shades of Chicago blues. 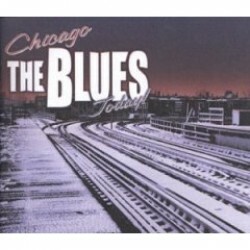 The third and final installment of Chicago/The Blues/Today! is the Big Walter Horton sides where the great harmonica master plays with both Johnny Young’s Southside Blues Band and the Johnny Shines Blues Band. One track features one of Horton’s young protégés billed as Memphis Charlie who plays second harmonica on Rockin’ My Boogie. Memphis Charlie Musslewhite’s inclusion on this album immediately established his blues credentials and, despite decades of uneven concert performances and mediocre recordings, placed his music above any objective criticism. Many of the players on Chicago/The Blues/Today! such as Junior Wells, James Cotton, Buddy Guy and Otis Rush would continue to dominate the blues scene for the better part of the intervening 50 years. Cotton and Guy are still on the circuit while Wells passed away in 1998 and Rush has been in retirement after suffering a massive stroke in 2004. Up to this time, the blues revival of the 1960s was just that, a revival. The 1959 book by Samuel Charters was the bugle call that summoned the charge for other writers, archivists and scholars to comb the backwoods of the American south in search of pre-war blues men. These troubadours from another era such as Son House, Skip James, Mississippi Fred McDowell, Sleepy John Estes and others fit neatly into the larger folk music craze that was already waning by the mid 60s. What Charters did with this album series is put the exclamation point on “Today.” In doing so he moved an audience, which he himself helped to create through his self-proclaimed romanticized narratives, to explore the acoustic side of this music. Now he almost single handedly brought the electrified Chicago version of this music to the vanguard of mainstream blues consciousness. Make no mistake, electric blues had been around for the better part of the last two decades and was not an exclusive providence of the city of Chicago by any means. The meaning of the words “Chicago blues” and “blues” practically morphed into the same thing in the minds of the general public. 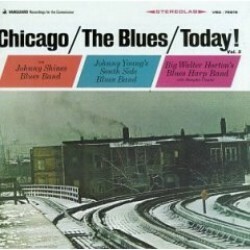 In the intervening years, as revisionist history and the monothematic narrative of this music began to take root, for better or worse Chicago/The Blues/Today! served as a kind of Holy Grail in which this false narrative could find a home. However, when re-visiting this album series, it is fun to listen to music that had the vitality of musicians clearly at their peak, making music that was still a pure artistic expression which didn’t pander to any market segment, current trend or some artificial taste maker. The bottom line as it relates to Chicago/The Blues/Today! is that regardless of its cultural impact, one way or another, these tracks are a wonderful document of a time and a place where great musicians gathered and made music in the moment. These records are generally regarded as essential entries into any blues library. These are true desert island discs. In April of 2015 Vanguard Records was purchased by The Concord Music Group. What impact this will have on the availability of these albums is anybody’s guess, but one could speculate that with global climate change, it might be easier to find a desert island than these discs. Editor’s Note: These CDs are currently available at Bluebeat Music both individually and in the three disc box set format.